The Weavers Friend Rag Rug Newsletter has been publishing since 1990. Twice a year this newsletter provides a forum for rag rug weavers to share their stories and experiences with other rug weavers. You will find here: tips on warping, cutting rags, color and design. and old loom restoration and repair. Emphasis is on rug weaving and the looms that were designed to make rug weaving practical and rewarding. Call 218 525 5778 or write to The Weavers Friend at 5672 N Shore Dr., Duluth MN 55804. Back Issues, any combination: 2 for $8, 4 for $15, 6 for $22, 4 for $29, 6 for $36, 8 for $43, 10 for $50. The Weavers Friend Newsletter Vol. 15, No. 1 Spring/Summer 2004 featured an in-depth article about Barn-Frame Loom restoration by Kathryn McMahon of Long Island, New York. See the Hand Made Rug Looms section for more. Here is a Deen Loom Company carpet cutting machine belonging to Judi Ruben from Mequon, Wisconsin. This hand operated cutter was used back in the 1920 and 1930s to slice ingrain carpet into narrow strips. At the same time the cutter also made a number of small slits on the sides of each individual carpet strip. This hand operated cutter was used in the manufacture of Chenille Fluff Rugs. 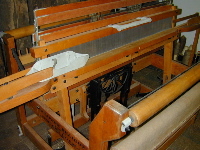 The Deen Loom Company sold this cutter along with its looms .Both cutter and loom were used in the process of recycling old carpet. Paul Lowers who owns and operates Riverside Loom Works has taken this machine back to Michigan for restoration. Newcomb Loom Co. Here from Raleigh, North Carolina is e-mail from Bob Steinbugler and his wife with pictures of a Weavers Delight they have painstakingly refinished. Chuck and Donna Ripley live just outside the city limits in Faribault, Minnesota. Chuck has a flock of 100 sheep which he cares for. He is a former instructor, active in 4H and community activities. Both he and Donna weave as well as collect antique textile tools and looms. 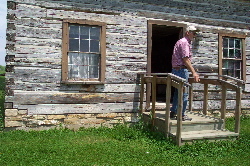 Two of their Norwegian looms are housed in an 1821 log house which is carefully maintained as a heritage museum. In side finished rugs are stacked on shelves. Browse handmade looms for more. 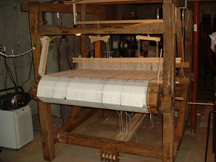 I attended a Conference on Norwegian Woven Textiles on October 21-23, 2005 in Decorah, Iowa. I enjoyed the event, its content and management, exhibits and quality conference book with all the wonderful pictures! It was a great privilege to be a part of this exceptional conference. As you can imagine, Norma Smayda's class was excellent. She has a firm grasp of her materials and 30-35 years of experience in handling a diverse group of students.